For a teacher like me, this moment was a pretty big deal. 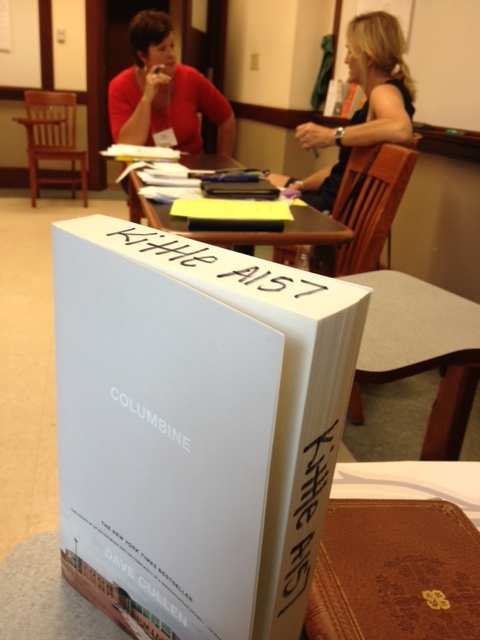 I attended the University of New Hampshire Literacy Institute and learned from Penny Kittle for two weeks. Her class was called Writing in the World, and I have to tell you, I learned more than I could have hoped for when I set off with my new green notebook for New England, a place I’d never been. I’d heard Penny present before, first at Region X here in DFW, and then again when my district brought her in for a couple of days–both turning points in my classroom instruction as I changed my thinking about teaching readers and writers and not just reading and writing. Then, of course, I was a fangirl at NCTE last fall in Las Vegas, tracing my hand in my notebook like she does in hers. But sitting in her class every day, listening to her read poetry, share videos of her students, and explain that all students will write–and write well–when they are given the opportunity to explore their hearts, reshaped me as an educator, and thankfully, I got my passion back. Everyone who knows me well knows I had a tough year. Lots of reasons, and none of them pretty. At one point I thought about throwing in the pubic education towel, even applied to Pearson in a moment of desperation. See? I was quite low. I can do better. I must do better. Of the huge stack of books I lugged home from UNH [I am Amy, and I am a (book) addict], Tom Newkirk’s Holding on to Good Ideas in a Time of Bad Ones resonates in my teaching soul. Even this one little thought speaks to me: “excellent instruction rarely feels rushed.” I know that, really I do, but why do I always feel like I’m in a hurry? When it comes to teaching writing effectively, helping students to see themselves as writers, allowing students to feel accomplished communicators, I must slow down. I need to do what Penny did for me in New Hampshire: relax into chair, look into my face, smile her warm smile, and speak to me like she already knew I was writer. ← OMG! Do You Think You Have Enough Books? Thank you, Amy, for your honest and thoughtful post. Thomas Newkirk’s book is one of the best, and I learned much by reading it, not the least of which was how to write about the day Dennis died. I might just try to go next summer even if I’m not in a classroom. Amy, you capture the essence of so many beautiful ideas and moments in this “piece”. Because you dig so deep, allow yourself these quiet moments of reflection, and believe in the power of educating; you are a stellar human being. This picture captures the magic. I wish you, and your very lucky students, a wonderful school year filled with challenge, beauty, and loads of laughter.